Meadowlands rare bird sighting – The Ruff. 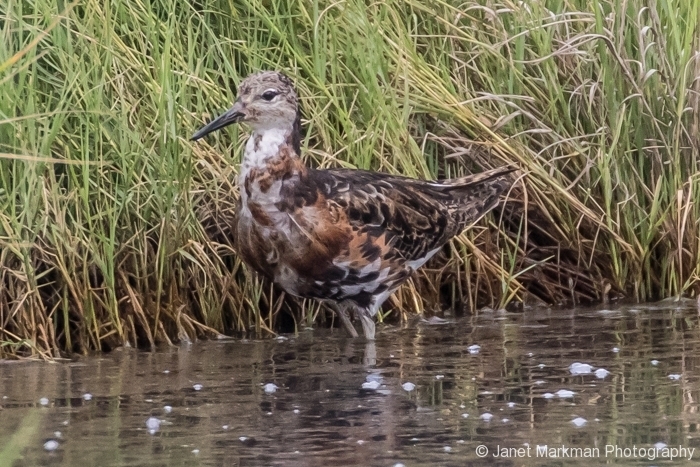 A male Ruff (Philomachus Pugnax), a member of the sandpiper family (Scolopacidae), has recently been spotted in DeKorte Park – a portion of the Meadowlands in New Jersey and owned/operated by the New Jersey Meadowlands Commission (2 DeKorte Park Plaza, Lyndhurst, NJ 07071) – www.njmeadowlands.gov. Not only is seeing a Ruff a rare occurrence here in New Jersey, but also throughout the contiguous United States as well. This bird was first sighted in the Meadowlands back on July 23, 2016 and I had the opportunity to see this bird on July 30, 2016. The seemingly odd name for a bird – “Ruff” – is descriptive of its large ornamental feathers that form a large collar on the male bird during breeding season (the female, who was not seen, is not as colorful and is called a “Reeve”). The males have a variable mixture of black, brown tan and white in their plumage. 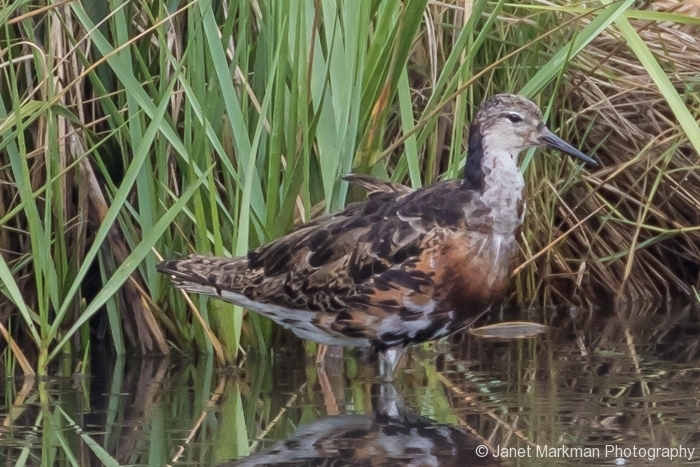 The male’s head and neck turns grayish brown during the non-breeding season, yet maintains its colorful body plumage – like the Ruff I saw at DeKorte Park. 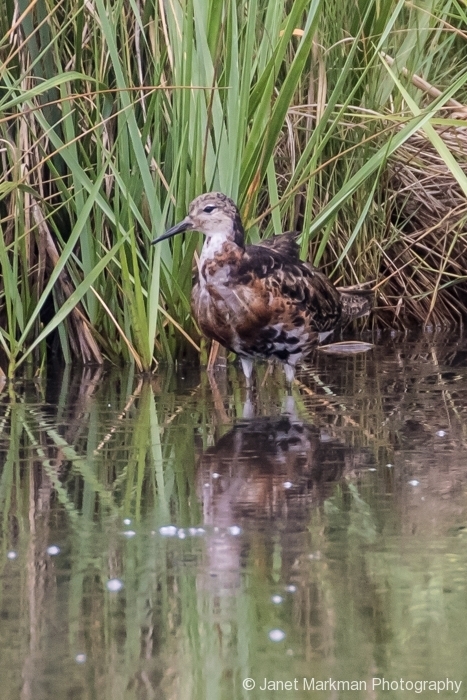 The male Ruff is a medium to large sized wading bird that stands about 11 inches tall, and whose size is comparable to the Greater Yellow Legs, a common bird in our area. (the female Reeve stands about 9 inches). The Ruff normally breeds in the Sub Artic and Artic tundra meadows in Northern Europe and Siberia, while spending it’s winters in wetland habitats throughout Southern Europe and Africa. These long distant migrants sometimes veer off course and somehow end up on the both coasts of the United States. 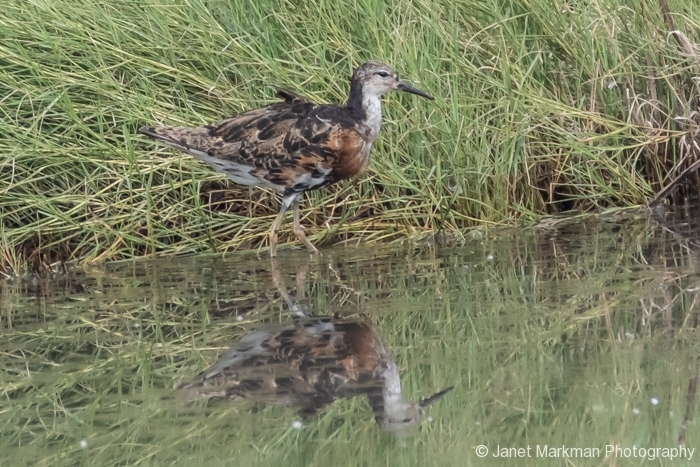 The Ruff’s preferred habitat is grassy Marshes, mudflats and flooded fields, which is exactly the type of habitat found in the Meadowlands. Mr. Ruff – welcome to the neighborhood!.